We’re thrilled to share the first details about We Happy Few‘s post-launch content! This free update will add an infinite mode, set in a world that you can customize as you wish (larger, smaller, more dangerous, less food, more Wellies, etc). You will be able to customize some of the rules of the game, including choosing to play as a Wellie (Wellie Mode!). This mode will bring back the systemic, sandbox world showcased in the early days of We Happy Few. Roger & James in: They Came From Below! Precocious Roger and Impetuous James set off in search of adventure and love, only to uncover bizarre technology and a terrifying new threat. All is not as it seems. Or is it exactly as it seems? Heartthrob, artist, and personal trainwreck, Nick Lightbearer is Wellington Wells’ most celebrated rock star—but what truly makes him tick? Tune in to Uncle Jack’s late show to find out. Much like any well-worn happy mask, all societies develop cracks in their veneer. But that doesn’t mean you should go digging up dirt from the past. Right? *pops a Joy pill* Right! 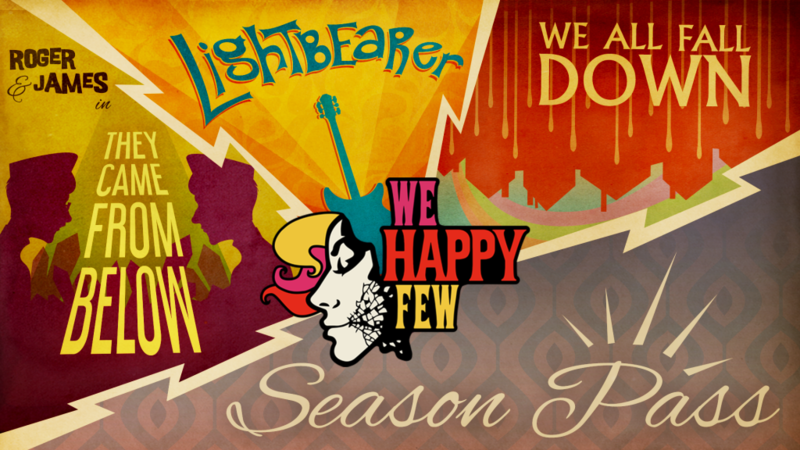 The Season Pass is currently only available as part of We Happy Few Deluxe Edition, but will be available for purchase separately upon launch. 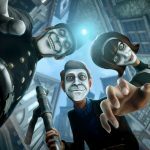 For updates on post-launch content and more, visit wehappyfewgame.com, and follow the official We Happy Few Twitter, Facebook, and Instagram channels!